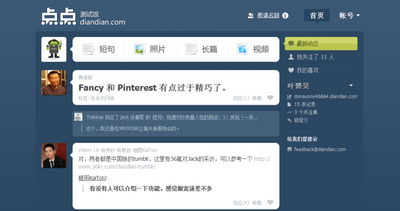 Now it’s Tumblr that is getting a Chinese copycat, TheNextWeb Asia shows. It’s called DianDian, which means “bit by bit.” Its founder previously worked at Renren and Kaixin, two Facebook clones. It’s worth noting that while many Chinese startups start out as clones of Western companies, they often expand and innovate into something completely unique. Tencent started out as an AIM clone and is now a huge social network/social gaming hub, which pioneered the kind of social gaming and virtual goods that are now such a huge industry in the West. Sina Weibo started out as a Twitter clone and is now a much more full-featured social network, Tudou started out as a YouTube clone and is now a full media company, et al.